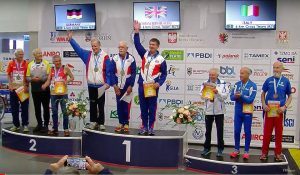 Barrie Roberts reports: Katie and I recently attended this year’s WMACi in Poland. We were last in Toruń for the EMACi four years ago. The Stadium was an excellent venue for the track and field events, and our Polish hosts ran the Championships very well indeed. The on-site catering was far from perfect, but fortunately there was a very good super-market opposite the main stadium, and of course, in Toruń City Centre itself (20 minute brisk walk away) there were an abundance of excellent cafes/restaurants. Eighty two countries participated, and we were part of the GB&NI Team Squad. I was pleased that Katie, in her usual efficient way, made sure that I registered for the Championships, declared by 4pm the previous day prior to each individual event, and made sure I got to the Call Room at the correct time! Also, drinks and energy bars were available when I needed them. I participated in three World Track Finals at 800m, 1500m and 3000m, the 6k XC (I was a member of the Gold winning GB&NI Team), and was the nominated reserve for two age cats in the 4x200m relays. The XC Team Gold was a pleasant surprise, and I have to thank my fellow Team members Philip Brennan and Michael Johnson for making it possible. A repeat of a Team XC Gold Medal in the EMACi held in Madrid last year i.e. the same three people. I had ‘warmed up’ for both 4x200m Relay Races, but on this occasion wasn’t needed. Preparing for and participating in Championships is quite energy-sapping. Being away from home, out of ones normal routine, staying in various hotels, flying to and from different destinations, coping with different climates, running indoors and outdoors, and invariably lots of walking and endeavouring to support ones fellow GB&NI athletes. Races can take place quite early in the day, or well into the evening. Early starts mean getting up early, probably missing breakfast and getting to the venue in good time prior to the start of ones event i.e. allowing sufficient time for a good ‘warm-up’; the shorter the distance the longer the warm-up. As Club runners many of us get used to running in the evening! It is good to be able to, occasionally, sing our National Anthem at a Medal Ceremony! The support from our fellow athletes/BvHers was and is very much appreciated. This entry was posted in Other races, Race Reports, Track, x-country by BvH Admin. Bookmark the permalink.